Book source ~ ARC. My review is voluntary and honest. It’s been three hectic years since the War of the Lotus and Ruun is far from healed. In fact, it’s barely healing at all. Despite Rowen Locke’s and his allies best efforts there is still strife and rumblings of even more unrest. When a new menace surfaces, threatening to bring down the Dragonward, Rowen and everyone he calls ally must once again fight to defend Ruun from its enemies and the exiled Dragonkin before it’s too late. 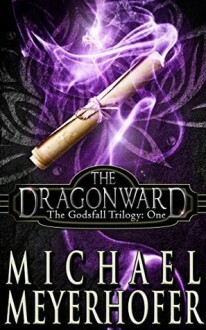 For those who have read and enjoyed The Dragonkin Trilogy this new trilogy in the world of Ruun will be right up your alley. For those new to the world of Ruun, you can start with this trilogy, but why? Why would you do that? You’ll miss all the struggles, sacrifices, battles, deception, and triumphs of the first trilogy that lead into this one. So don’t skip it. But if you must, then this first book does a decent job of dropping you into the world and not being totally lost. Poor Rowen. The unwilling hero just wants to live in peace after witnessing the near destruction of his world. But he’s not going to get it. Told from multiple POVs the action is near non-stop. There are several factions coming together from beginning to end and having multiple viewpoints is the only way to get the full immersion in this world. Some characters I love, some I hate, and some I really loathe, but make no mistake, you won’t walk through this story without feeling something for each one. The world is rich with history and depth and it makes my heart ache knowing that the characters I’ve come to love will get no peace again in it. At least, not just yet. The Dragonward may be done, but the Godsfall trilogy has only just begun. *Book source ~ ARC. My review is voluntary and honest. Runn is in chaos with several kingdoms trying to claim dominion over the others. And in the midst of it all is an ordinary man thrown into an extraordinary situation and now in possession of a rare and powerful artifact, the sword known as Knightswrath. As rulers jockey for power, an ancient Dragonkin makes himself known for the first time in many centuries. He has hidden himself well and slowly built himself an army previously thought to be myth. He wants Runn for himself, but with others fighting for control there’s no guarantee he’ll win. Unless he can get his hands on Knightswrath. Everything will depend on Rowan Locke defeating Chorlga, but each time he uses the sword he loses more of himself. When the final battle is upon him, will he be enough to save all he holds dear? 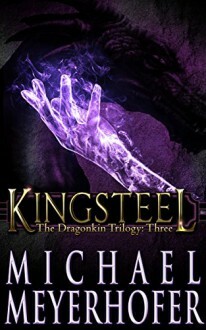 The final installment of the Dragonkin Trilogy is full of action, battles, hardship and loss. But it’s also full of hope and the knowledge that when people come together they can do amazing things. The beginning of this tale picks up where Knightswrath left off. Before I go any further, this is not a standalone novel. Well, ok, maybe it could be? But seriously, don’t. Go back to book 1, Wytchfire and start from the beginning. This is epic fantasy people. You must start at the beginning to appreciate what comes after. And after is where this book shines. All the POVs are coming together, riding fast to the end. Omg, that end? I can’t say anything without giving away great stuff, so I’ll just say this: Read the whole trilogy! Also, could I please impale Crovis on a spike à la the Dhargothi? Pretty please? 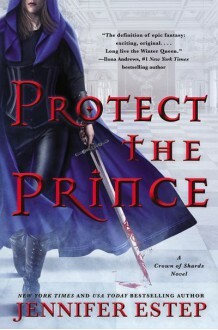 Just Pre-Ordered "Protect the Prince"
The second in the Crown of Shard series, Protect the Prince - Jennifer Estep, is dropping July 2, 2019 -- I just preordered. 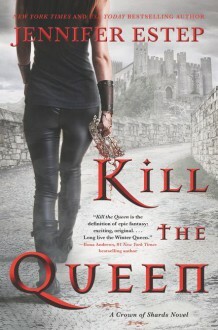 It's the sequel to Kill the Queen - Jennifer Estep . A Storm that will wreck a world threatens Dematr. Only Mari, one of the Mechanics who control all technology through their Guild, has a chance to stop it. She and Mage Alain have survived numerous attempts to kill them and have gained many more followers, but the Storm of chaos, born of centuries of enslavement, grows ever closer. Mari leads an army now. She and Alain must fight together to bind back the Broken Kingdom and build a force strong enough to defeat the might of the Great Guilds. But the Storm has many Servants who seek to preserve or gain personal power or wealth, or fear the New Day that Mari seeks to bring to the world. And Mari knows that victory will mean nothing if the precious knowledge brought long ago to their world is destroyed. In order to save it, Alain and Mari will have to pierce through the heart of their enemies' power and confront once more a place of ancient nightmare. This story is the fifth book in a fantastic epic fantasy series called The Pillars of Reality. I absolutely loved it! Mari is a fantastic character. I liked her immediately when I met her in the first book. I love her determination to do the right thing, even at the cost of her own life. A Master Mechanic, Mari has faced many threats to her life from the Guild Masters on the world of Dematr and survived. Foreseen by Mages to be 'The Daughter of Jules' and fated to free the world of Dematr from the tyranny of both the Guilds - Mechanics and Mages - and to unite the Mechanics, Mages and Commons against said Guilds, Mari finds herself fighting for their freedom. Mage Alain is also a fantastic character. I liked him a lot from the start. He was one of the youngest Acolytes to achieve Mage status at the age of seventeen. He has been taught from a young age not to show or feel any emotions and that the world he lives in is an illusion, where nothing is real. I love how this character has grown as the series has progressed. He tries to show more emotion, even though his Guild had virtually beaten it out of him. He hides a dry wit under that emotionless mask. I listened to this story in audio format, rather than read it. MacLeod Andrews once again narrates the story. He does a fantastic job of bringing the story to life. Even Alain, who's voice is meant to be flat and emotionless comes across with subtle hints. You would think that Alain's voice would be monotonous, but it's not so. I love the way he brings all the characters to life with different accents, inflexions and tones. He even makes the women's voices sound perfect for each character. As for his narration, he read the story clearly and concisely, and his pacing was perfect. I would listen to more books read by this narrator. The story continues six months from the end of The Pirates of Pacta Servanda and sees Mari and Alain heading a mixed army of Mages, Mechanics and Commons as the action heats up. Mechanic Caylou (not sure of spelling as I listened to the story so have no reference and have spelt it phonetically - it could be Kayloo or another variation) makes another appearance. He is one of Mari's friends from the Mechanics Guild, along with his girlfriend, Ally, who also makes an appearance. I love her constant use of 'Your Daughterness' when speaking to Mari just because it annoys her. Mage Asha also makes another appearance, as does Mage Dov, who is Asha's uncle, and Mechanic Dov (no relation) whose relative had once lived in Marandur. Cien, a princess of Tae, plays a significant role in this story, too. There are a few more characters added, but it would take me too long to mention them all. I love the world building in this series. It is familiar though strange at the same time. It has a mix of steampunk and modern day technology, but this is due to the way the Guilds restricted people from creating new things. The story is full of action, adventure, and danger and I found myself an emotional wreck at times. In this story, the characters are gathering together for a showdown with the Great Guilds. They also make a dangerous journey back into the Imperial territory of Marandur to retrieve the mechanical texts left at the University. The action is ramping up further as the storyline reaches towards the climax, and I found myself holding my breath more than once as they faced several tricky challenges. Have you ever read or listened to a story and felt utterly emersed in it? It happened to me as I listened to this book. These characters have come to life for me and have become my friends. 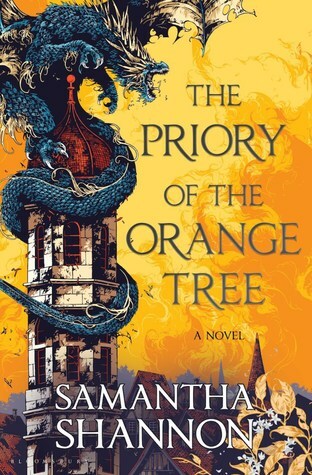 This book ends with a slight cliffhanger, which had me eager to listen to the next story in the series, The Wrath of the Great Guilds, as soon as possible. 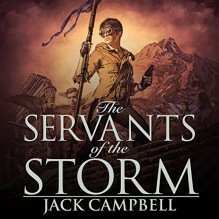 Jack Campbell has written a fantastic science fiction series. I have added him to my favourite author's list, as he's found a fan in me. I love his writing style, which is fast-paced and descriptive, and the flow of the story is good too.